By @SimonCocking review of The Value of Everything: Making and Taking in the Global Economy by Mariana Mazzucato, Allen Lane (UK), PublicAffairs (US). Who really creates wealth in our world? And how do we decide the value of what they do? At the heart of today’s financial and economic crisis is a problem hiding in plain sight. In modern capitalism, value-extraction is rewarded more highly than value-creation: the productive process that drives a healthy economy and society. From companies driven solely to maximize shareholder value to astronomically high prices of medicines justified through big pharma’s ‘value pricing’, we misidentify taking with making, and have lost sight of what value really means. Once a central plank of economic thought, this concept of value – what it is, why it matters to us – is simply no longer discussed. Yet, argues Mariana Mazzucato in this penetrating and passionate new book, if we are to reform capitalism – radically to transform an increasingly sick system rather than continue feeding it – we urgently need to rethink where wealth comes from. Which activities create it, which extract it, which destroy it? Answers to these questions are key if we want to replace the current parasitic system with a type of capitalism that is more sustainable, more symbiotic – that works for us all. The Value of Everything will reignite a long-needed debate about the kind of world we really want to live in. It is not without good reason that economics is the called the dismal science. In fact you could make a convincing argument that it is not really much of a science at all. Policies are often driven by ideology first, and the stats and data then shoe-horned into relevant results, to prove or disprove the validity of the economic policy being asserted. 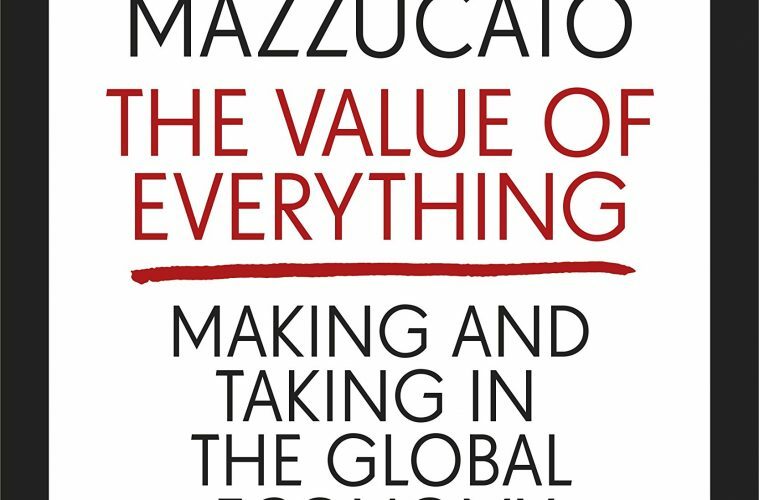 Mazzucato has written a timely and important book, aiming to pull up the carpet and question many many of the current cosy assumptions that have driven our global and national economies into the messy and inefficient situation we are currently facing. The results of the Brexit referendum and the 2016 US election illustrate that we are no longer on a seamless upward path of growth, and consequently a much larger number than expected are economically worse off than before, unhappy, and keen to blame someone. Mazzucato clearly demonstrates that the concept of ‘value’ has been dragged and bashed out of shape. While tech-bro billionaires are popping out of the wood, suddenly worth more than they could have ever dreamed of, time and time again it has happened on the back of public funded research, DARPA, NASA and CERN anyone? And these are only a few of many many examples, where state funding has provided the platform for companies to then go private, and realise the massive riches that they have been able to leverage from standing on the shoulders of giants. Mazzucato raises points that do need to be addressed. Here in Ireland and Apple’s nontaxation agreement with the Irish Government for example, benefits a few massively, while many subsidise it. Afterall, the EMEA staff live in the country, and avail of the schools, roads, hospitals and all the other things that taxation of corporations should go to fund – but not if all corporate profits are routed out via shell companies over to subsidiaries over in states where corporate tax is not payable. Her book is timely, important, and needs to be listened to and addressed, because ultimately otherwise we are all the losers from allowing the status quo to continue. Next ArticleA swim, cycle and run to success: what can organisations learn from a triathlon?